The transit of Venus used to be important because Sir John Herschel correctly predicted, in the 18th century, that the distance of the earth to the sun could be determined by measuring the transit times from far apart places on the earth and using some trigonometric calculations together with Kepler's laws to determine the distance. He was correct, but the accurate measurement that was required was difficult to achieve because of the vast distances that had to be travelled, the challenging political and natural hazards of that era, as well as a phenomenon that came to be called "the black drop effect", wherein the orb of Venus appeared to be connected to the limb of the sun by a thin black thread (an optical effect, not a real connection), making accurate timings almost impossible to achieve. These days the transit is important because scientists hope to use the event to find out more about how to search for exoplanets as they transit the disk of their distant suns. The were many great adventures, triumphs and tragedies that resulted from these early attempts, including the hook up of Mason and Dixon, who later went to the United States to measure a boundary that would bear their name and become famous for dividing the slave from the free states in the US. These stories are well worth reading about. In the era of the Internet, there are apps that will attempt to crowd-source the timings, and they will be fun and enlitghening to use, even if you don't view the transit or participate in making timings. More about them and the transit here. Unfortunately, your Starman of Mitzpe Ramon will not be in Israel for this event, so, sadly, you are on your own. Remember, never look at the sun without adequate and proper optical protection. You will permanently damage your vision if you do. This event is best seen with a telescope with a solar filter, although with your (properply protected) naked eye you should be just be able to make it out, although not with enough detail to perform any timings. There are a number of places to buy eye protection to view the sun in Israel including Bareket Observatory and the retailer Cosmos. Bareket observatory should also be able to tell you where public viewing of the transit will be done in Israel. 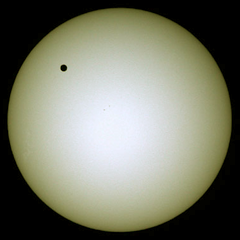 Good luck seeing the last transit of Venus this century. We will miss you. And remember...Keep on Lookin' Up!